This week, Australian transplant turned Tahoe powder hound, Jason Layh, of Alpenglow Sports takes over the North Lake Tahoe social channels for an in-depth look into everything backcountry. Layh has chased snow all over the world, including parts of Europe, Australia, Canada, Japan and the United States. He now works at Alpenglow Sports, a North Tahoe core mountain shop since 1972 that’s staffed by expert outdoorsmen and women who have a passion for educating their customers about the incredible terrain across the North Shore. In Part Two of our backcountry series, Layh gives us the scoop on backcountry gear and outfitting necessary to head into Tahoe’s beautiful outdoors. Check out Part One for everything you need to know about backcountry locations, beginners guides, avalanche training, and more. You are typically on your feet the entire time you’re backcountry hiking or touring, which creates a lot of wear and tear for your inner-most insulation. Merino is fantastic, as far as wool is concerned. It’s a very soft, dense fiber. There are a lot of sock manufacturers out there with 100 percent Merino wool, or some with a nice synthetic blend, some are durable, others are not. Try Stance socks, they use a blend and stand up nicely to the rigors of the backcountry. For the best Merino, look for socks from Australia or New Zealand. The wool wears better and you’ll get more than just five or six runs out of them. The boot is the most important part of the equation. If you have a boot that fits you well, you can ski any binding and any ski. For someone who anticipates spending about half of their ski time or less in the backcountry, I recommend more of a traditional alpine boot – flatter sole, typically a little heavier, they are also stiff so you can still push yourself while inbounds skiing and brace for impact. Inside the shell of your boot there is going to be a liner that offers vital insulation. Your expert will heat it up to literally mold the liner into all of the nooks and crannies of your foot for maximum comfort and insulation. You’re going to want to walk around the store when you’re first trying on boots to check how the forward flex (resistance) and cuff rotation (ability to move your ankle back and forth) feel. All boots also come with a forward flex rating, but just as with shoe sizes, forward flex can vary slightly between brands. Heavier, stronger and more athletic people are likely to need a forward flex with a higher rating than someone with less experience and athleticism. Then, cuff rotation is going to be important to determine your range of motion. That’s going to be important as you pivot to go up the hill. Invest in an orthotic or over-the-counter footbed to support your arch and prevent your feet from losing circulation as they splay and stretch from use. Listen to the expert who is fitting you – sometimes the best boot for your foot isn’t the brand you’ve seen in a magazine, or had a friend suggest. Never wear skinny jeans to a fitting (we learned this the hard way). Access to your calves is important to feel the difference in fit between boots. I recommend a tech binding for a boot with tech fitting. Bindings with certified DIN toes and heels (which most are prominently marked with) are incredibly safe and easy to work with. I suggest investing in G3 Ion or Dynafit bindings. Plate bindings dampen vibrations and stand up to the daily pressures of inbound skiing, but they are also very heavy and make every step uphill much harder. When you’re choosing skis, you are typically looking at a carbon or wood laminate material. Carbon is a bit lighter, but very strong, with a flex pattern that won’t break down. For these, I recommend looking into DPS skis. Black Crows, on the other hand, make a fantastic durable and lightweight wood laminate ski with a beautiful flex. As for shape, if you’re skiing in firmer, harder conditions, typical of resort skiing, a narrower ski is best for winging around corners on edge. 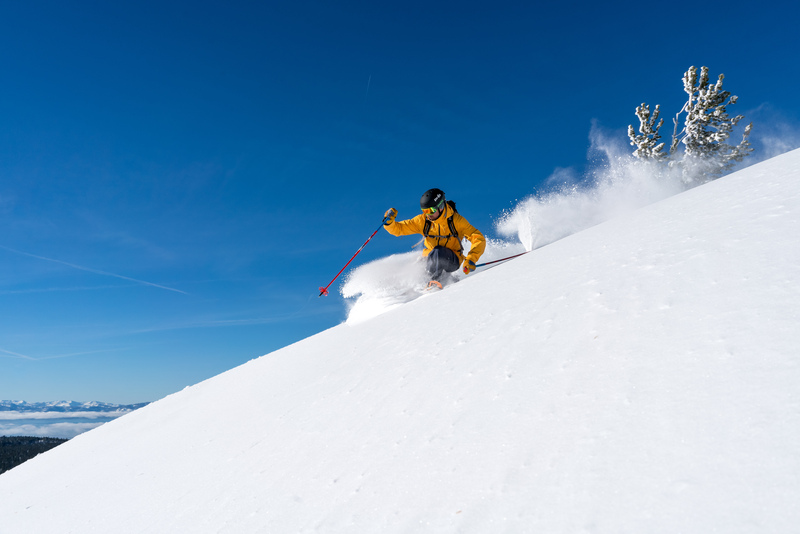 With backcountry skiing, you’re more likely to be skiing on fresh snow and powder, so something wider under the foot is going to be more advantageous; however, the ski shape is more of an individual choice, and there is no delineation between the shape of an inbound ski versus one for backcountry. Similarly, camber and rocker comes down to a matter of personal preference. Every company is playing with a combination of camber and rocker, the style the ski is constructed to touch the snow with various points of contact. I recommend renting skis, or trying them out during the Lake Tahoe Backcountry Demo Day, which will be January 21 this year, to settle on which pair works best for your needs. Keep your skis freshly waxed, but not over waxed. Having the correct wax for the day’s conditions is great, but leaving to much wax on your ski will interfere with the glue on your skins. Finding the perfect balance is a key to a good day. Waxes should vary, depending on the temperature of the snow, so ask your local expert for suggestions for mid-winter versus spring snow. Rust or discoloration of the metal edges of your skis can be fixed by taking them into your local expert to be cleaned or sharpened, or by running a gummy stone along the edges. If you are skiing out of bounds, it’s recommended you have a backpack on you at all times that’s packed with a beacon, shovel and probe, and know how to use each of these pieces of equipment. If there is a slide, all of that equipment is going to be there to help you or someone else get out of a dangerous situation. The backpack should also be packed with a first aid kit, one or two layers of extra insulation, snacks and water. Want to know more? Visit www.alpenglowsports.com, or stop by one of the many backcountry gear stores around North Shore to connect with an expert on renting and purchasing gear. The post The Ultimate Backcountry Guide: Gear and Outfitting appeared first on Go Tahoe North.